Read my reviews of issue #1, issue #2, issue #3, issue #4, issue #5, annual #1, issue #6, and issue #7. Firstly, I absolutely love that cover. Wow. The issue also opens on an amazing two-page spread full of women fighting. Super cool. Cul is paralyzed while he possesses the Destroyer and is having a very creepy experience controlling it. He’s way too happy about it. Odin seems ashamed of what he’s done, maybe? It’s difficult to tell. Meanwhile, in the fray, so many comic book heroines are present! People who have been Marvel fans for longer than I have will recognize more of the women, but it was cool to recognize the ones I knew. I was a little confused though; Thor defeats a Destroyer single-handedly in Thor, but here it’s a much hardier foe, needing dozens upon dozens of heroes to fight it. I wonder if they downplayed the power for the movie. I absolutely love Freyja’s rebellion against her husband during this fight; it’s extremely empowering to see her stand up for not only herself, but her entire kingdom. Eventually, Odin calls the Destroyer away, to the chagrin of Cul, muttering, “Damn you, woman. Damn you for making me the villain.” You did that to yourself, bud. All of the heroines start to part ways (I really want to read Silk after seeing her in action here! ), giving Thor advice and asking for payment and all that fun stuff. Freyja warns her that she can never come to Asgard, but she’ll never be alone or wanting for aid. After the battle, Thor confronts her, revealing the last name on the list who wasn’t accounted for at the battle: Rosalind. She will not confirm her identity, and Odinson practically begs her to tell him the truth, and if she does, he will reveal what Nick Fury whispered to him. However, just at that point, Rosalind herself shows up in the flying car. Odinson was wrong, and he hilariously spends the next couple of pages gawking in disbelief while Rosalind introduces herself to Thor. She’s pretty ticked because she came to the island to investigate Dario, but the storm from Mjolnir messed her all up. Odinson rips up his list and offers Rosalind a drink at the nearest mead hall. Freyja returns to Asgard; the guards tell her she can’t go in the throne room because Odin doesn’t want to be disturbed, and she basically says she doesn’t care. On Jotunheim, King Laufey gets resurrected with the help of a horrid blood sacrifice. Uh-oh. In the last few pages, Thor’s identity is revealed, and it gave me utter chills. On the last page, instead of “next time,” it says “There is only Secret Wars.” In the letter to the editor, Jason Aaron reveals that this is the last issue of Thor; because of Secret Wars, the Marvel Universe is changing. 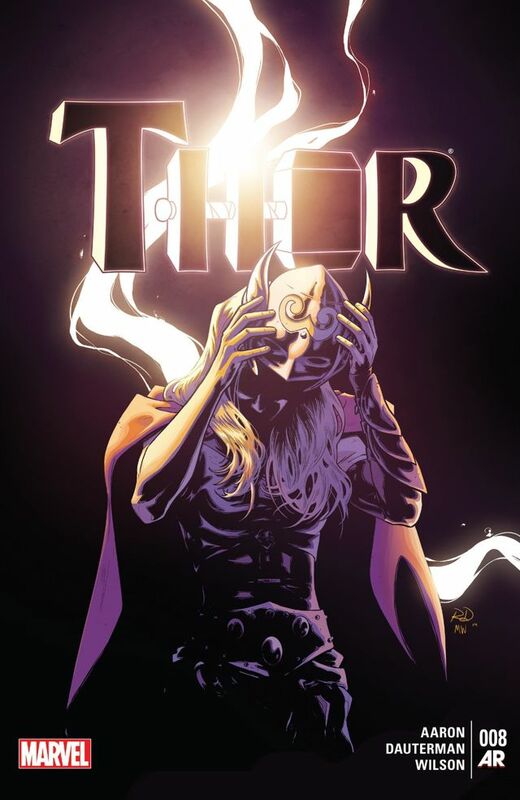 He also says that issues 1-8 of Thor were really just a prologue, and we’ll have to check out Secret Wars and his upcoming series with artist Chris Sprouse, Thors. He describes it as “a gritty cop series. Only with hammers instead of guns. Lots and lots of hammers. And also Frog Thor. And a few more surprises.” Looks like I’ll have to check that out! I’m not sure if I’ll review it, but we’ll see. Get it on Comixology, Marvel Digital, or at your local comic shop for $3.99.